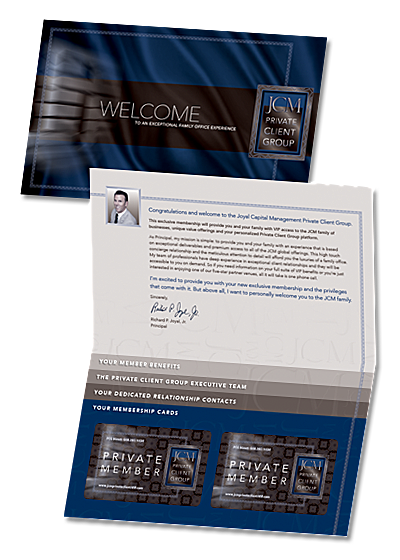 An exclusive membership to the JCM Private Client Group will provide you and your family with VIP access to the JCM family of businesses, unique value offerings and your personalized Private Client Group platform. Our mission is simple: to provide you and your family with an experience that is based on exceptional deliverables and premium access to all of the JCM global offerings. This high touch concierge relationship and the meticulous attention to detail will afford you the luxuries of a family office. Our team of professionals has deep experience in exceptional client relationships and will be accessible to you on demand. So if you need information on your full suite of VIP benefits or you’re just interested in enjoying one of our five-star partner venues, all it will take is one phone call. JCM is excited to provide you with your new exclusive membership and the privileges that come with it – a welcome to the JCM family. 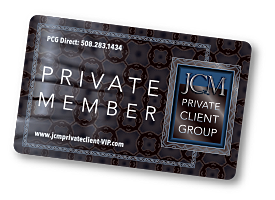 Each JCM Private Client Group member receives an exclusive membership card which affords them VIP status at the many JCM-affiliated venues listed here.